KANSAS CITY, Kan. — An outstanding athlete in baseball, basketball and football at Bishop Ward High School here, Father Ron Cornish scored the interest of the New York Yankees with his pitching. But the young Kansas City, Kan., native graciously declined the opportunity to take a swing at a professional baseball career. He was going to play for God’s team instead, and enter the seminary. Even though thousands of baseball fans never cheered him on in a major league stadium, longtime friend Msgr. Michael Mullen, pastor of St. Patrick Parish in Kansas City, Kan., has a feeling Father Cornish actually touched many more lives during almost 45 years as a priest. “He was a coach, a teacher, as much off the sports playing field, as on it,” said Msgr. Mullen in his homily at Father Cornish’s funeral. Father Ronald Joseph Cornish died of heart failure on Feb. 15 at Olathe Medical Center, just two days after his 71st birthday. Between his first assignment at Assumption Parish in Topeka and his final assignment at Prince of Peace Parish in Olathe, Father Cornish served as associate pastor and pastor at several parishes, chaplain and counselor at Immaculata High School in Leavenworth, and as a teacher at Savior of the World Seminary in Kansas City, Kan.
“He loved the people in every parish where he was,” said longtime friend Msgr. Thomas Tank, pastor of Church of the Ascension in Overland Park. The people Father Cornish served — from kids to seniors to non-Catholics who still flocked to his Masses at Villa St. Francis skilled-nursing facility in Olathe — loved him, too, his sister Loretta Hentzen added. “Everybody loved Father Ron,” she said. Although Father Cornish, who underwent several major heart surgeries in recent years, retired from active ministry in 2008, he still celebrated several Masses each week and assisted parishes as needed. He told Msgr. Mullen at the hospital the day before he died that if he were not ill, he would be attending a course on the Catechism of the Catholic Church as part of the Year of Faith. Msgr. Mullen believes Father Cornish’s deep faith took root in his tight-knit, generous family. Born on Feb. 13, 1942, he was the middle of Nicholas and Julia (Gergick) Cornish’s seven children. 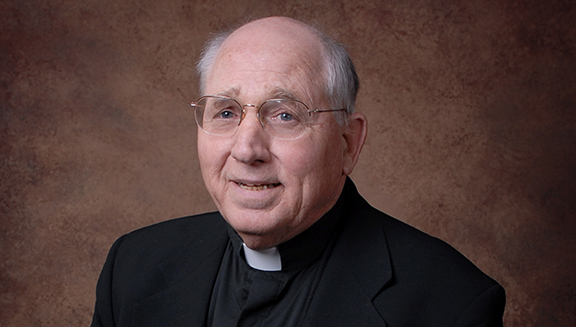 Father Cornish attended Holy Family School in Kansas City, Kan., and graduated from Bishop Ward High School in 1960 (the school recently inducted the alum into its hall of fame). Despite a baseball scout expressing interest, he headed next to St. Thomas Seminary in Denver, where he earned his bachelor’s in philosophy and master of divinity degree. On June 1, 1968, Archbishop Edward J. Hunkeler ordained Father Cornish and two other men as priests at the Cathedral of St. Peter. Everyone liked to be around him, he said. They’d just had lunch together — along with several friends — a couple of days before Father Cornish died. But he also had a sense of compassion that drew people to him. He enjoyed answering phone calls at Birthright, which offers support to women facing unplanned pregnancies. He knew the severity of the heart problems he faced, and yet he embraced every day. Father Frank Burger, now parochial administrator at Mater Dei in Topeka, has known Father Cornish since they were classmates at St. Thomas Seminary. He believes his friend trusted that whatever happened was God’s will. Father Cornish was part of the same Jesus Caritas priest fraternity group as Msgr. Mullen and Msgr. Tank, along with several other priests. One of his most prized possessions was a quilt that young people in a ministry called REACH — Religious Education and Activities for the Community Handicapped — made for him. “He really was deeply touched by that,” said Msgr. Tank , noting that Father Cornish was dedicated to serving that group over many years. Father Cornish was also a member of the Knights of Columbus and helped out with Beginning Experience, a ministry that reached out to Catholics who were widowed and divorced. Msgr. Mullen overlapped with Father Cornish in the seminary, but they really bonded when they taught at Savior of the World together in the ’70s. Since that time, they had often vacationed together and had in fact just returned from staying with Ward classmates of Father Cornish’s when he took ill. Thinking over a lifetime with her brother, Hentzen recalled how he had made a point to celebrate every baptism, marriage and other event possible within the family, she said. “I just cannot tell you how much we’ll miss him,” she said. Father Cornish was preceded in death by his parents, brothers-in-law, James Hentzen and Gerald Bock, and a nephew, Christopher Hentzen. He is survived by siblings Larry Cornish and wife Jeannie; Loretta Hentzen; Rita Bock; Don Cornish; John Cornish and wife Phyllis; and Jim Cornish. He also had many cherished nieces and nephews and great- nieces and nephews. A Mass of Christian Burial was scheduled to be celebrated Feb. 21 and Father Cornish is to be buried in Mount Calvary Cemetery in Kansas City, Kan.